Carnal Flower is like a homage to the distinctive, seductive heady tuberose. I’ve always encountered tuberose and approached it with a semi-satirical love. I don’t actually like tuberose that much but I smell it so strongly in fragrances that it converted me over to the tuberose side some time last year. In Bottle: Big old tuberose. Though the tuberose used in Carnal Flower has a cleaner, clearer presence than what I would normally get. Carnal Flower is made of higher quality materials than most perfumes, and the aroma of the tuberose with this crystal clear, heady but tempered scent is the reward. Applied: There’s a very brief moment upon application where the tuberose hasn’t hit my nose yet where I can smell a sheer pretty base of clean gentle citrus and flowers. Then tuberose makes its entrance and it is all I get from then on. But as stated above, the tuberose in Carnal Flower has this crystalline and pure quality to it. It’s a natural aroma, smells very complex and is not too strong or sour. it’s perfectly full, dense, and heady. White florals all the way on this one as the tuberose heads the way from the top to the middle to the bottom where you’re greeted by the bolstering of the scent. Soliflores are fascinating in how they manage to smell so complex for a perfume focused around a single flower. Carnal Flower is one of these beautifully complex soliflores. The fragrance is elegant, powerful, and is an extremely good example of how beautiful a high-quality tuberose scent can smell. Extra: Carnal Flower’s got a lot of selling points but one of the more famous is its boast that its smell is that of the most natural tuberose. I’m inclined to agree. This stuff is very good. Design: Bottled in much the same way as other Frederic Malle scents. A cylindrical glass bottle with a cylindrical cap. It doesn’t look flashy, garish, nor does the shape of the bottle hinder the purpose of the bottle in the first place. The packaging is a bit plain, I admit, but the stuff inside the bottle is what you’re really looking for when you buy a Frederic Malle fragrance. Notes: Bergamot, melon, eucalyptus, ylang-ylang, jasmine, tuberose, Salicylates, tuberose absolute, orange blossom absolute, coconut, musk. Since winning me over, tuberose has since convinced me that it wouldn’t be a bad idea to have it sitting around on the off chance that I get the urge to smell like a big white floral. Hey came around to liking tuberose from a year ago. Who knows what might happen a year from now? Maybe I’ll be so crazy for tuberose that it would be all I ever wanted to smell. 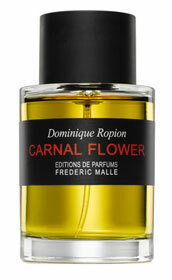 Reviewed in This Post: Carnal Flower, 2008, Eau de Parfum. This entry was posted in frederic malle, Reviews By House, soliflore and tagged bergamot, coconut, eucalyptus, jasmine, melon, musk, orange blossom absolute, Salicylates, tuberose, tuberose absolute, ylang-ylang. Bookmark the permalink.